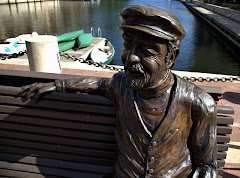 Restonian: News blog from Reston, Virginia, the mauve-colored New Town (tm): Flashback Friday Monday: Reston Town Center, or Tysons Two: Electric Boogaloo? Flashback Friday Monday: Reston Town Center, or Tysons Two: Electric Boogaloo? 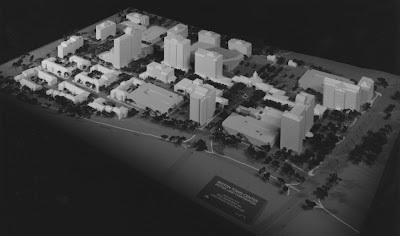 Here is an exciting scale model of the Reston Town Center, back when the Fake Downtown was still but a gleam in developers’ eyes. Man, this is a piece of crap. The building designs are clearly lifted from that well-known mecca of architectural restraint, Tysons Corner -- you can see several ripoffs of the attractive Shopping Bag Building design, plus a bunch of buildings that look like what might happen if the Tysons Ritz-Carlton mated with an East German apartment block, ca. 1973. We especially like the cupola-topped “skywalk” over some massive traffic artery, presumably meant as an homage to the Capitol building -- or maybe just a really big 7-11. Also, is that a shiny domed stadium hiding near the back of the picture, in a furtive attempt to entice the then-Baltimore Colts to a new city? Come to think of it, "Reston Ravens" kind of has a nice ring to it. To sum up: Wow. We never thought we’d say this, but this makes the current Fake Downtown look pretty good by comparison. "Electric Boogaloo"?! I am officially your newest fan. I'm a product of a planned community living (Co-Op City in the Bronx) so Reston has been an attractive alternative to the sprawl that is my greater Tysons neighborhood. I would ultimately prefer the city life but can't afford a parking spot let alone private school tuition for 2. So, Congrats! you've got a new reader...for now.